W 105th St and Columbus Ave. Welcome to a Creative Commons learning environment for community biodiversity based on La Perla Garden - an oasis of biodiversity at 105th Street and Columbus Avenue in New York's Upper West Side. 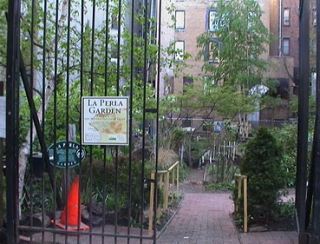 Established in 1991, La Perla Garden is one of over 600 registered GreenThumb community gardens in New York City, and is affiliated with the Manhattan Land Trust. At the heart of the learning process is Composting at La Perla Garden. Composting is a wonderful process through which garden waste, that can be combined with kitchen waste, is transformed by an assortment of microbes, insect and worms into humus that enriches the soil, encouraging healthy microbial action and increasing the soil's ability to retain moisture.